Newcastle United have announced all proceeds raised in tonight's Northumberland Senior Cup will be generously donated to Blyth Spartans. The Magpies U23s host the FA Cup giant killers side at Whitley Park with a place in the semi-finals of the competition up for grabs. Blyth, managed by ex-Newcastle youngster Alun Armstrong, released a club statement a few weeks ago stating "changes are required to ensure the club can be financed at an appropriate level to be competitive." Spartans, who currently compete in National League North, continue to punch above their weight with the part-time outfit competing against the likes of Stockport County and York City - who are both full-time. While the club are in no immediate financial difficulties, the Blyth board want to ensure their finances match the level they are playing at. 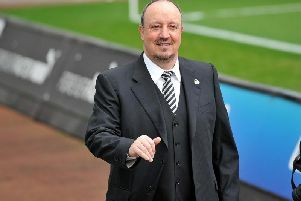 And Newcastle have kindly decided to come to Blyth’s aid - donating all this evening’s proceeds to the non-league side. Admission at Whitley Park on Tuesday night is £4 for adults and £2 concessions. There will be no free entry for United season ticket holders or members. The Magpies lifted the Senior Cup last year, defeating Morpeth Town at St James's Park.